We are looking forward to another amazing season with all our student/athletes, coaches, and families ! Click here for 2018 Race Results and Photos! Click here for 2018 Raffle Wrap-up! 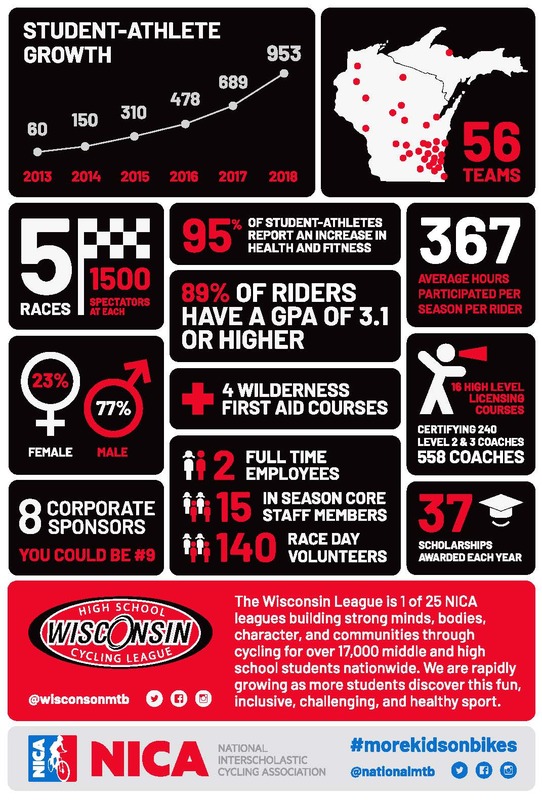 The Wisconsin High School Cycling League welcomes all those interested to become involved in interscholastic mountain bike racing. Our comprehensive program of training for students, coaches and teams is available to all. How does the Wisconsin League do it? Where do coaches learn how to start and manage a high school mountain bike team? What are the do’s and dont’s of maintaining a healthy team or new league in your state? Learn how to bring the Wisconsin High School Cycling League to your school! Special Thanks to our 2018 Gold Club Members! Join our Gold Club Supporters by donating $100 or more to the Wisconsin High School Cycling League. To become a Gold Club member, simply stop by the merchandise table at our next race or email the league. When you see a Gold Club member, join us and thank those who have already joined the club. Please check your company for any matching contribution. Want to stay updated on WI League news and events? Join the WI League Single Track Times newsletter today for the latest news.